Discover the true nature of the threat to Rivenspire. I need to locate Verandis Ravenwatch and find out if he can tell me more about Baron Montclair and where he might be hiding. He may also know more about what set Montclair on this path of destruction. Meet Count Verandis Ravenwatch at Ravenwatch Castle. Learn the secrets of the memories. Verandis should be at Ravenwatch Castle, which is located near the town of Crestshade, to the west of Shornhelm. I should go there and talk to him. Verandis wants me to follow him. I may as well see what he wants to show me. Verandis wants me to examine his memories. He thinks I may be able to see something that he missed. All I need to do is drink the potion on the table. I should drink the potion and see what happens. I drank the potion and entered Verandis' memories. In fact, in the memory, I am Verandis. I should try to discover what happened in this memory. My dream-walk through the memories of Verandis Ravenwatch continues. 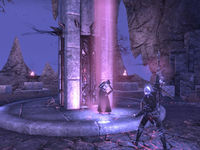 It seems that the secret of the first memory concerns some kind of Ayleid relic that Reezal-Jul found. Now that the second memory has begun, I should speak to Verandis. Verandis has experienced some kind of hole in his memories. I need to explore this memory and see if I can discover the moments that he lost. I learned that Reezal-Jul had secret information concerning the healing stone, including Ayleid texts he translated. I should talk to Verandis and tell him what I saw in his memory. My dream-walk through the memories of Verandis Ravenwatch continues. In this memory, I need to accompany Baron Montclair to the top of the Doomcrag to find the Ayleid relic. My dream-walk through the memories of Verandis Ravenwatch continues. We've entered the lower level of the Doomcrag and activated some type of ancient defense—animated skeletons. We must defeat them before we can proceed. My dream-walk through the memories of Verandis Ravenwatch continues. We've entered the second level of the Doomcrag and activated some type of ancient defense—a bone colossus. We must defeat the creature before we can proceed. My journey through the memories of Verandis continues. We've reached the top of the Doomcrag. The Ayleid relic should be through the doors ahead. I should follow the others inside and see how events unfolded. My journey through Verandis' memories continues. I entered the relic chamber. Now I should talk to Baron Montclair and see what happened next. My journey through Verandis' memories continues. I entered the relic chamber and Baron Montclair has begun the ritual to heal Leia, I should observe what happens. My journey through Verandis' memories continues. I entered the relic chamber and Baron Montclair has begun the ritual to heal Leia, I must lend my power to the ritual by touching the Lightless Remnant. My journey through Verandis' memories continues. Baron Montclair progresses through the ritual to heal Leia. I should observe what happens. Leia has turned into a bloodfiend and asked that I end her pain. I should put her out of her misery before she kills me. Finishes quest The dream-walk through Verandis' memory of the Doomcrag has come to an end. I should find Verandis and speak to him. This page was last modified on 3 January 2019, at 20:16.